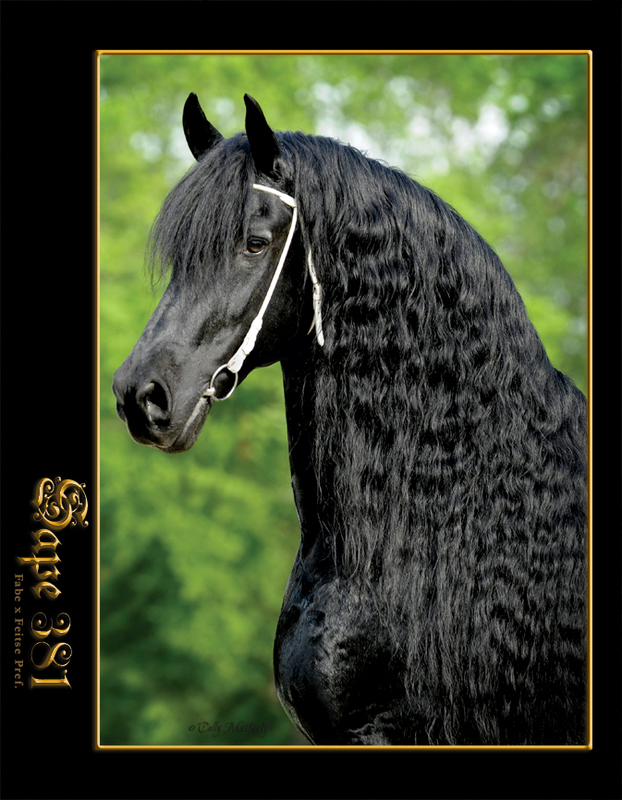 Norbert 444, Germanic Given name (meaning--Shinning, bright man of the North). 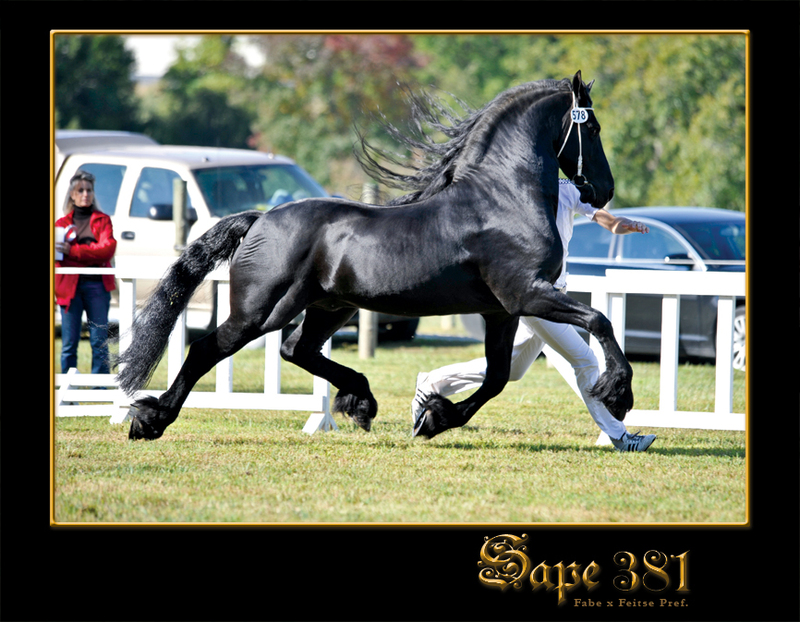 Norbert Is one of the KFPS's most Elite breeding stallions. 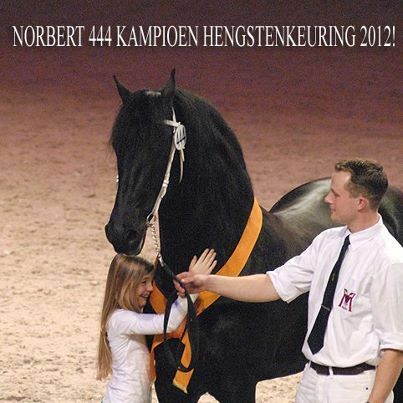 Norbert has accomplished just about everything--- Multiple champion, Reserve Champion, horse of the yr, sport predicate and so on. 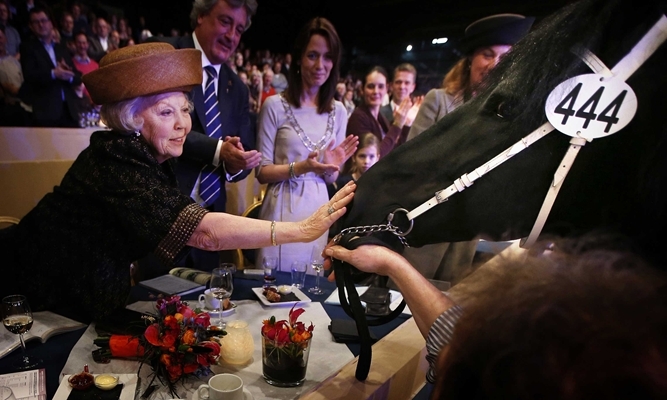 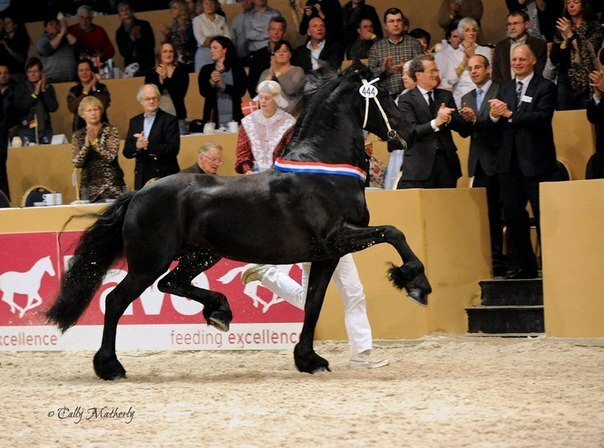 In 2012, 2013 and 2014 he won the title of Overall Champion at the Stallion show in Leeuwarden and in 2010 was Reserve Champion. 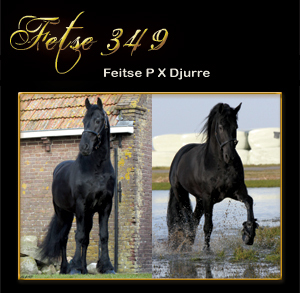 In 2013 he was awarded KFPS horse of the yr. To add to his accomplishments he has sired 6 outstanding sons, Hessel 480 (which was reserve champion 2015) and Hette 481 (which was reserve champion 2014), Julius 486, Menne 496, Rommert 498 and the newest Matthys 504. 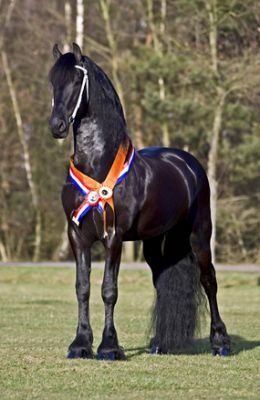 Norbert stems from a very well respected stamline 25 (1914). 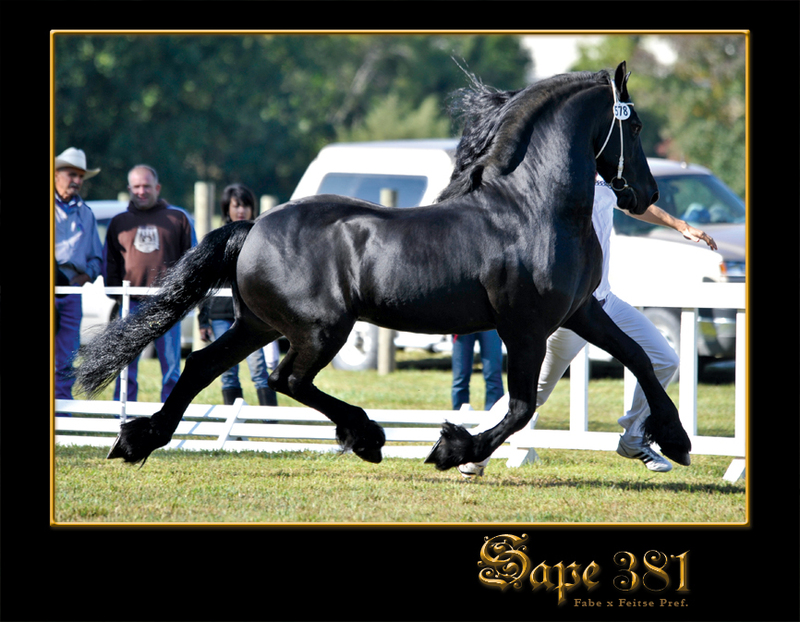 His sire is the famous Preferent stallion Tsjerk P 328 X Hearke P 254. 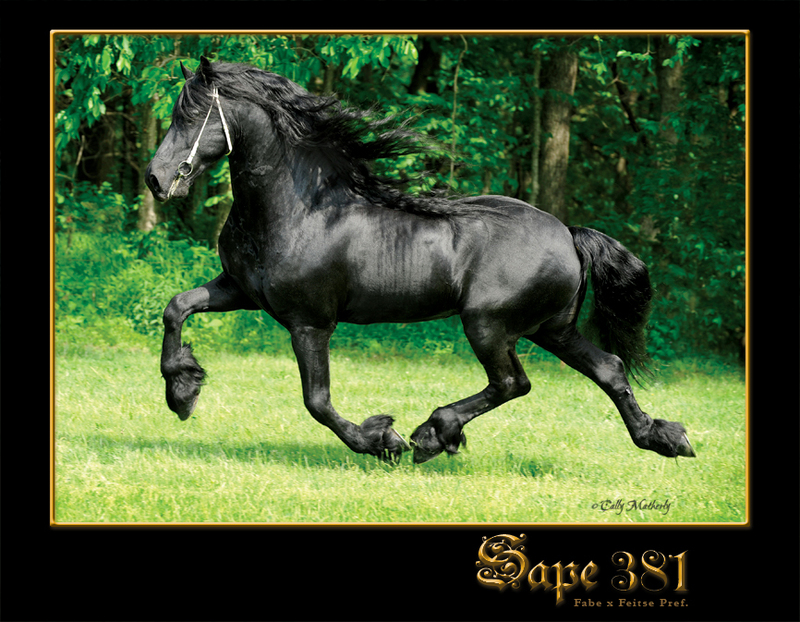 Mother line just as impressive, MP*4 x SP*6 & add to it Low in breeding. 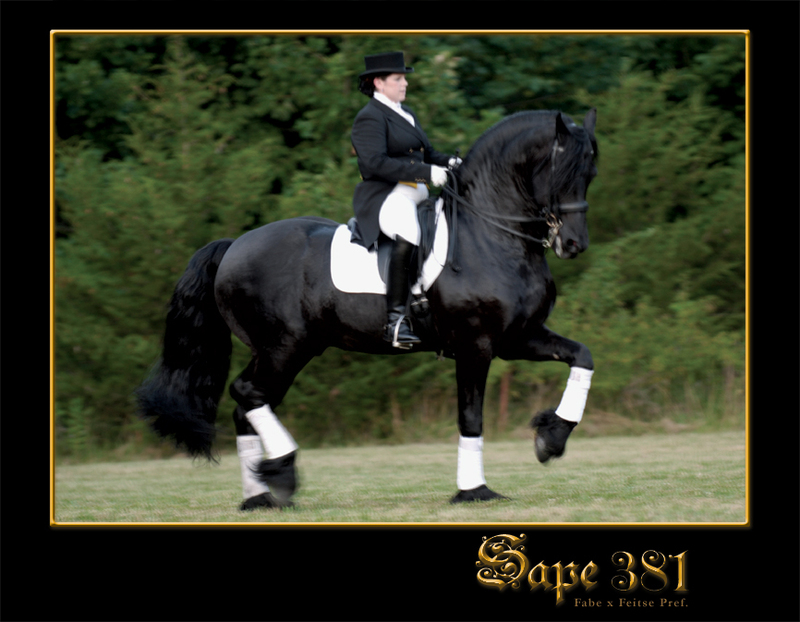 Norbert obtained his sport title and is Z1 dressage w/ 15 points. 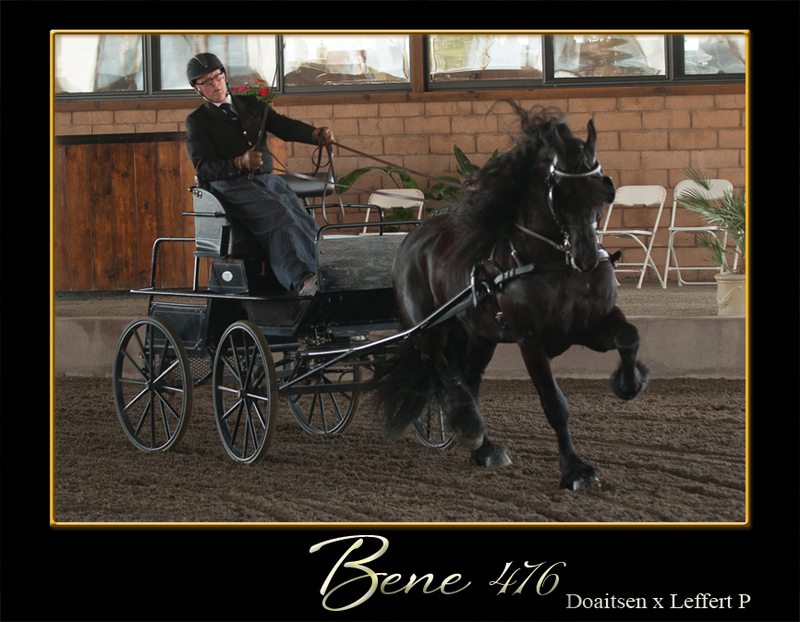 Not only an excellent dressage stallion but also a multiple winner in Harness. 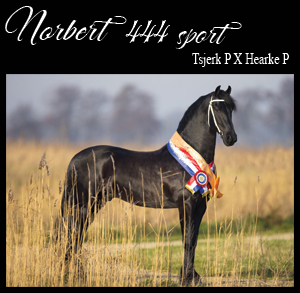 Norbert has it all, outstanding accomplishments, top producer (64% Ster percentage), stems from great stamline, impressive papers, tall (16.2 hands), champion in multiple disciplines and a personality to melt your heart. 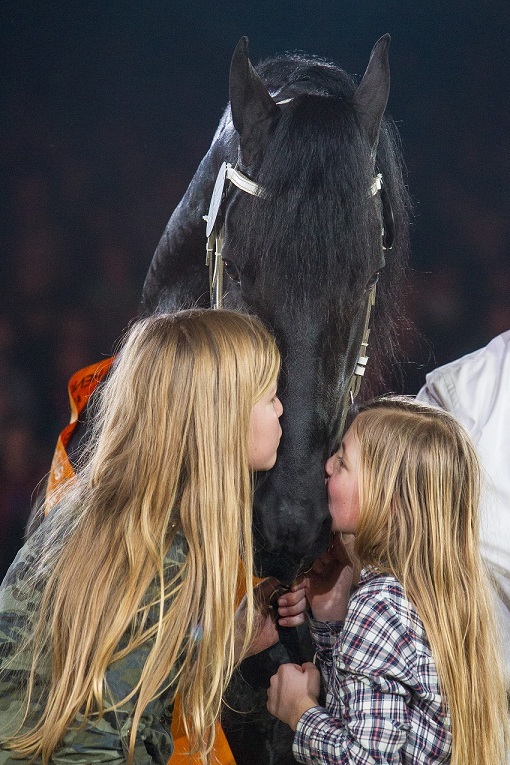 He is kind and very people oriented. 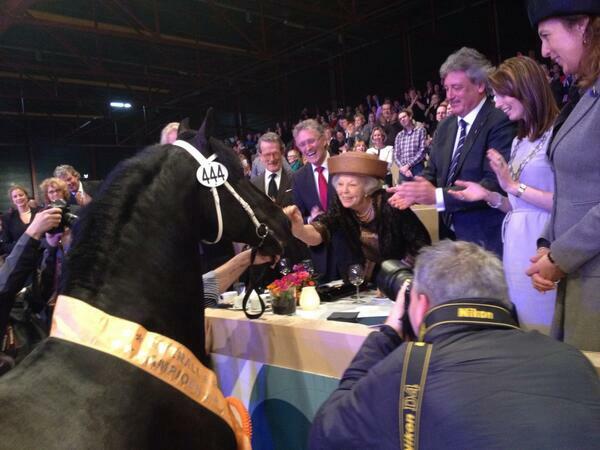 He has so much to offer mares. 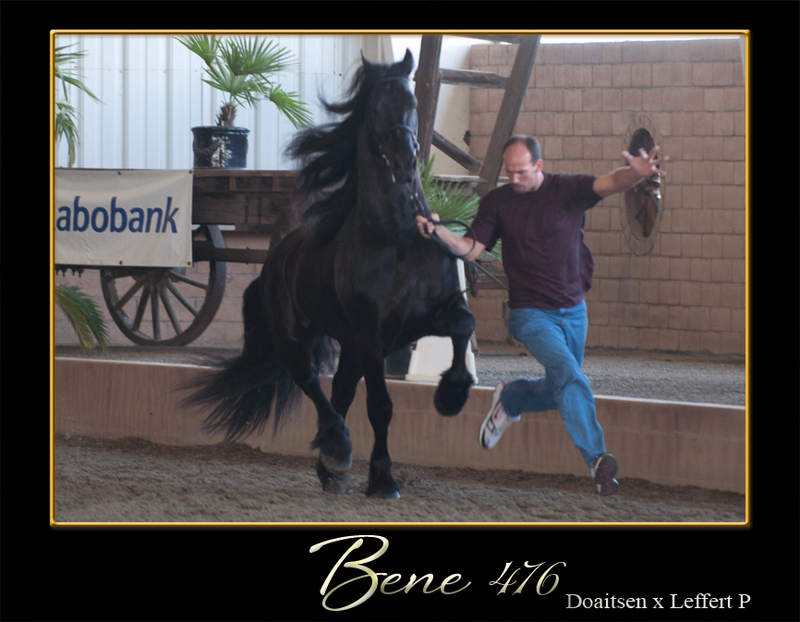 There are no words to describe Norbert's movements! 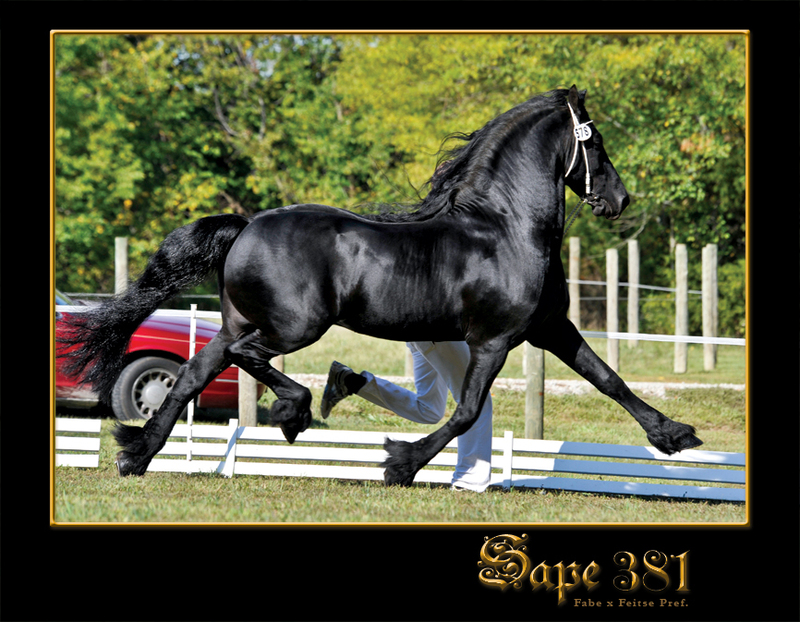 He is balanced, strong, supple, super extension and uphill. 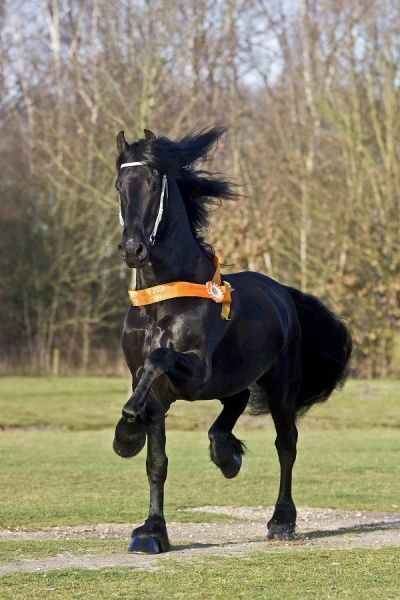 His trot, well, no words for his trot other then WOW! 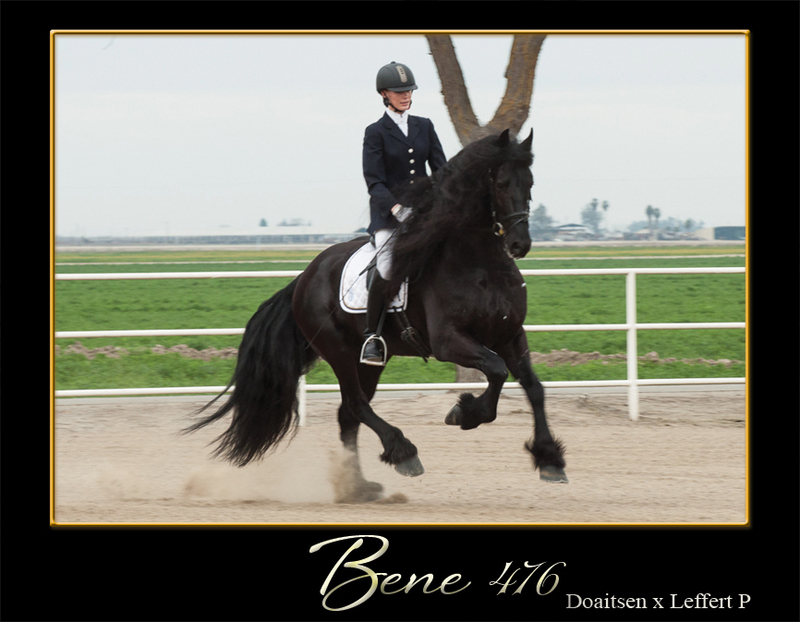 Norbert's offspring also show great balance and uphillness. 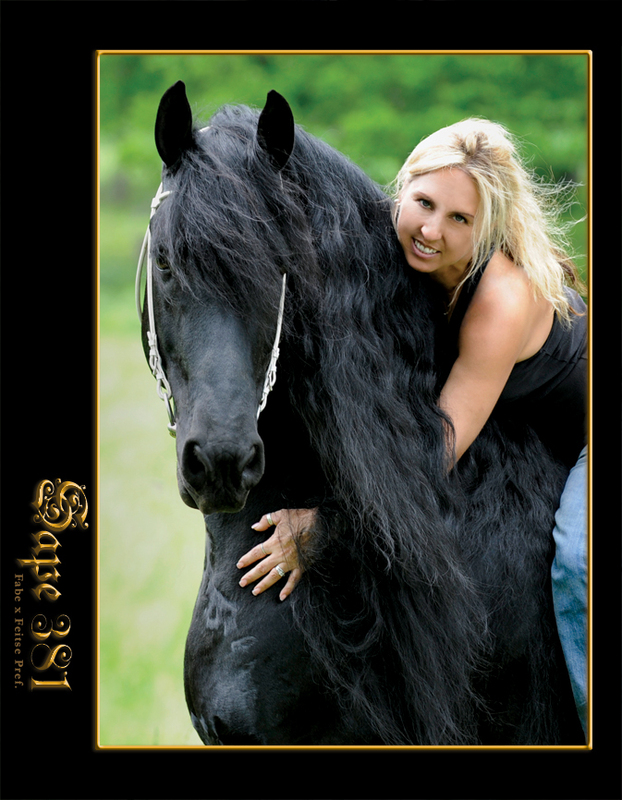 Unbelievable amount of Points based on offspring! 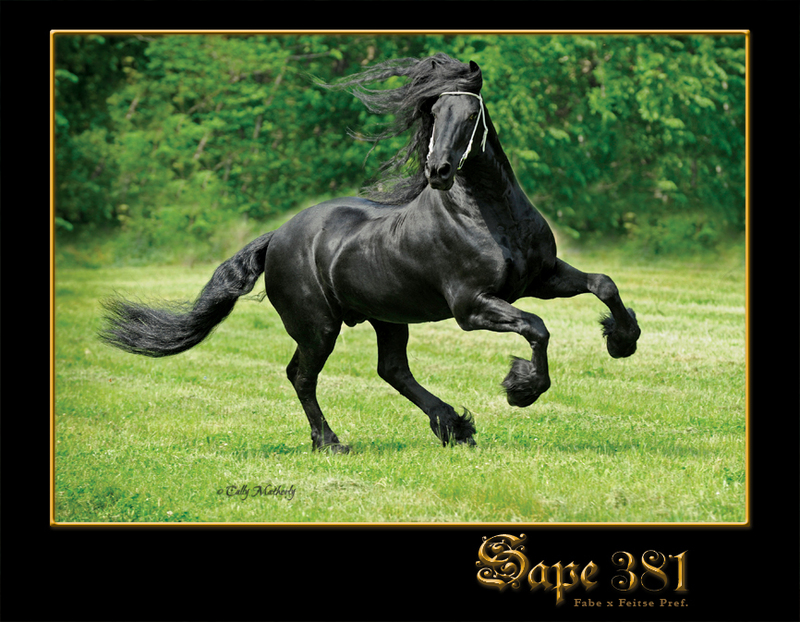 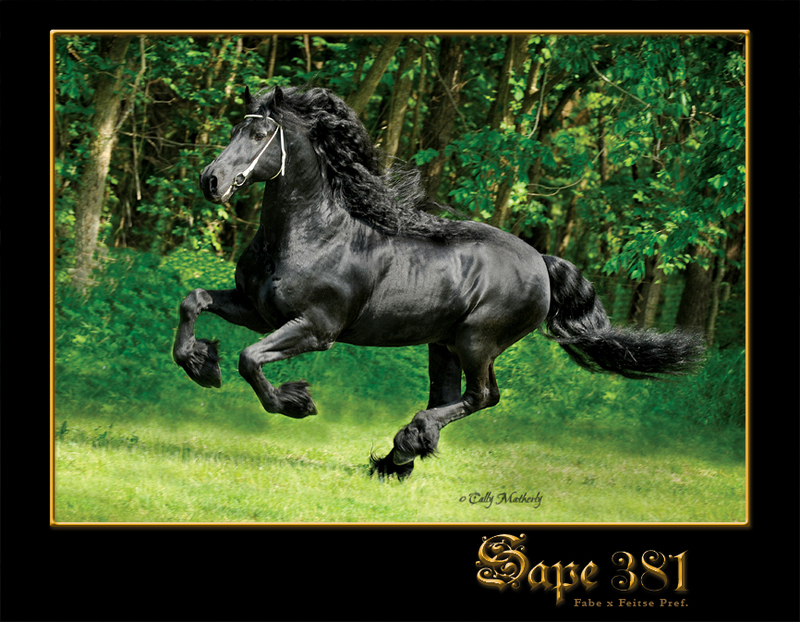 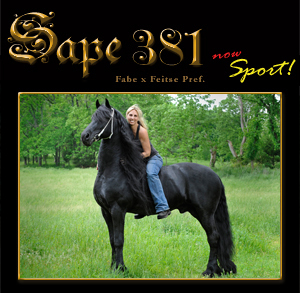 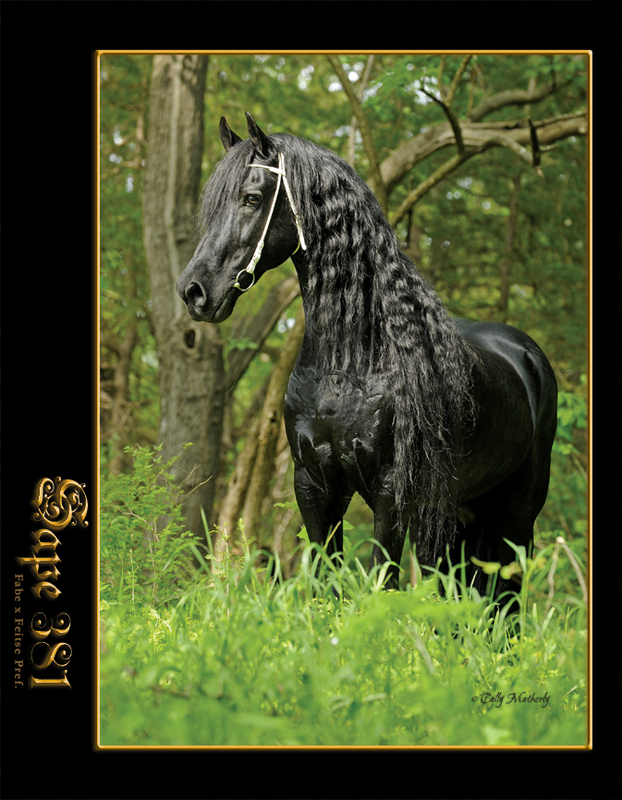 Sape 381 is one of the premier KFPS approved breeding stallions in the world. 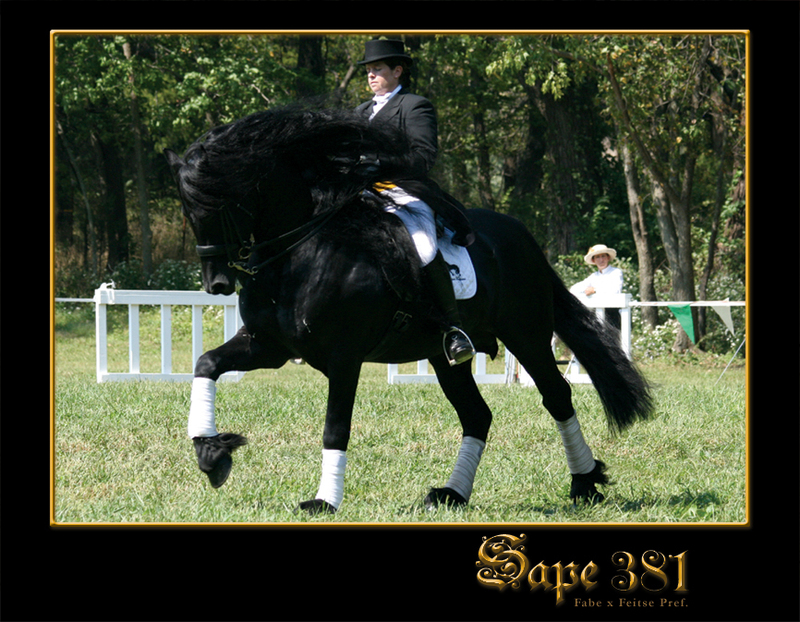 Some of his accomplishments include 2001 KFPS World Champion Stallion, 2002 Reserve Champion, 2004 Reserve Champion and earning his Sport title in 2010. 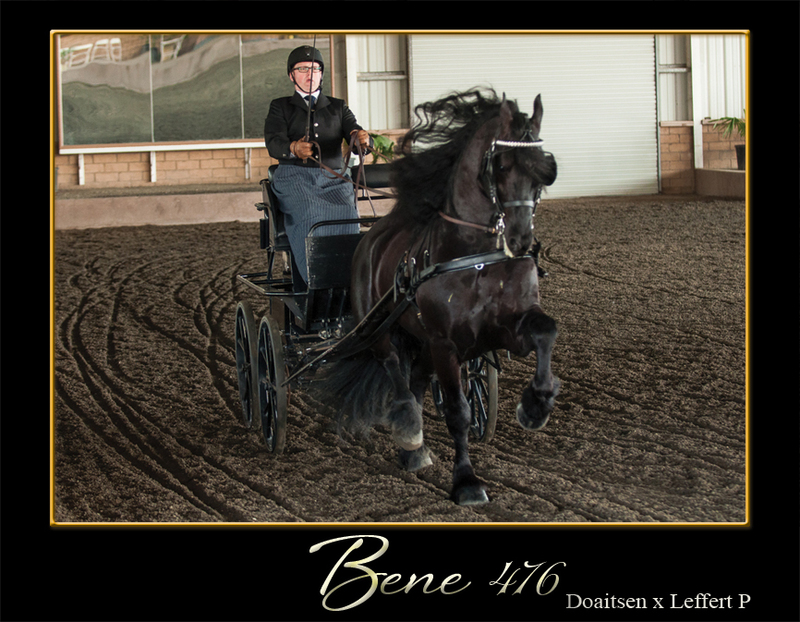 Not only is he a champion himself but passes the same qualities onto his offspring. 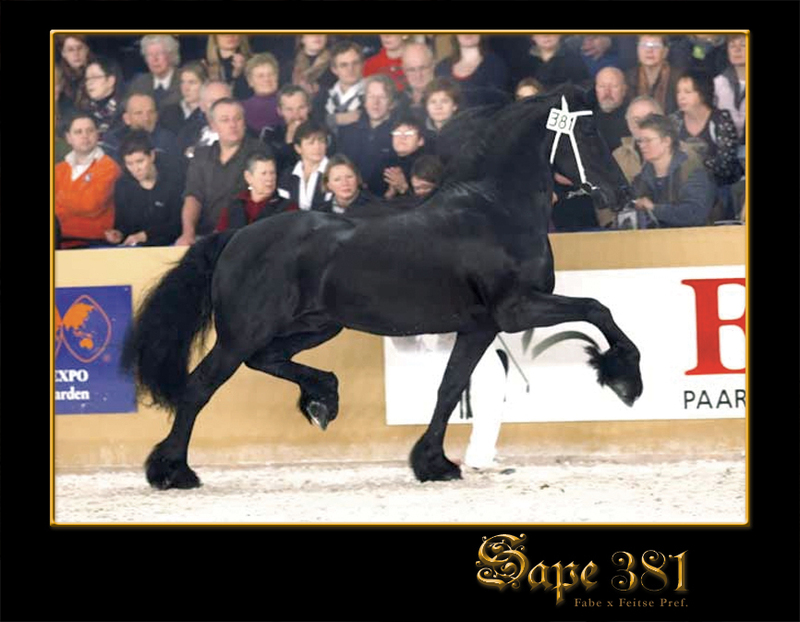 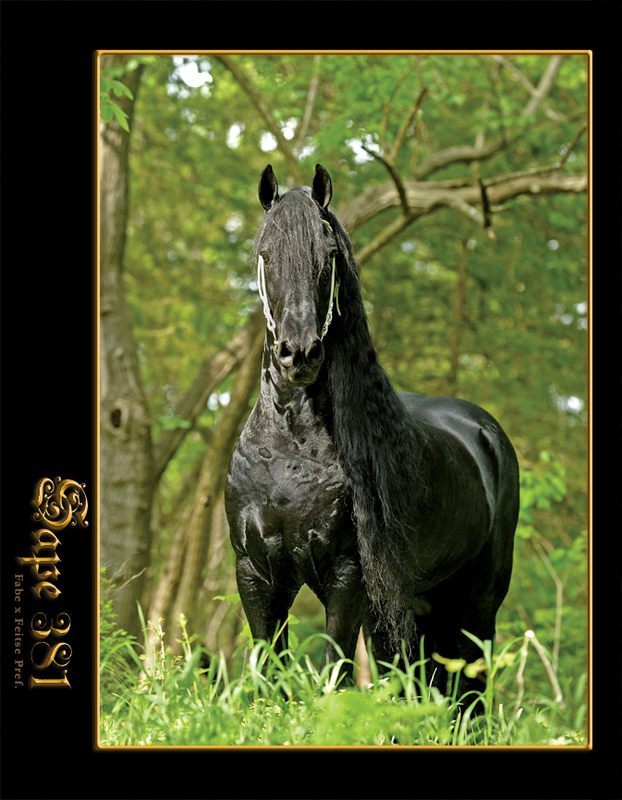 With a extremely high Ster Mare % and 1st & 2nd Premie foal %, Sape 381 has proven to be a great asset to the Friesian horse. 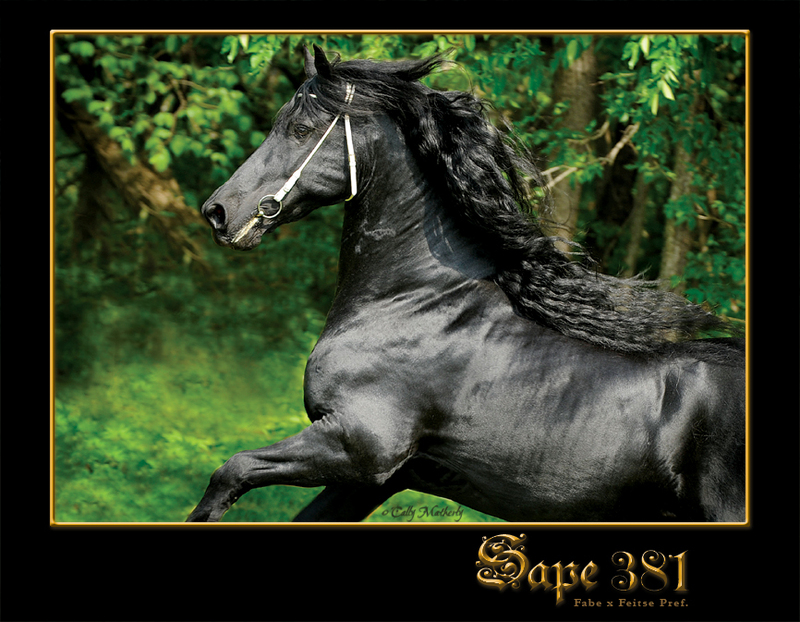 A stallion with much expression in appearance and in gaits. 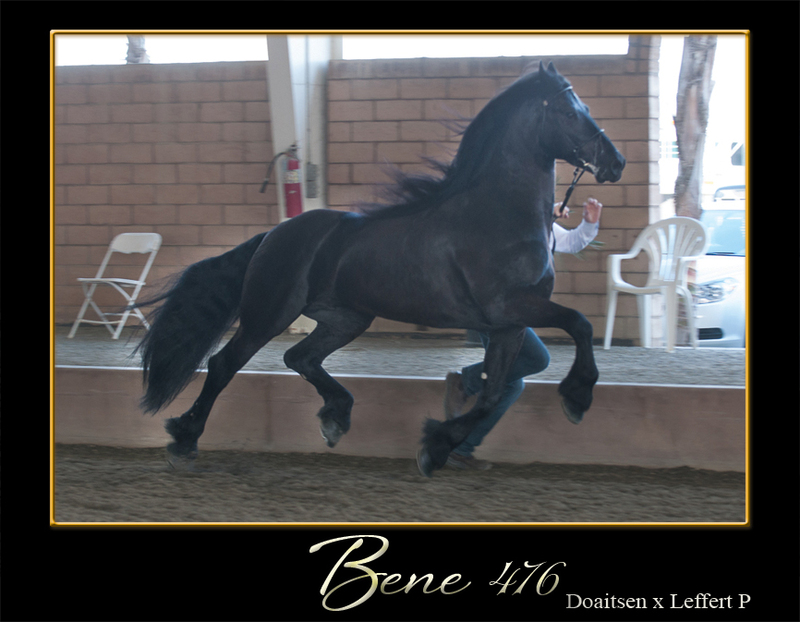 With a strong hind leg and freedom he exhibits in his shoulder allows him to propel forward giving that large and reaching trot that is so sought after. 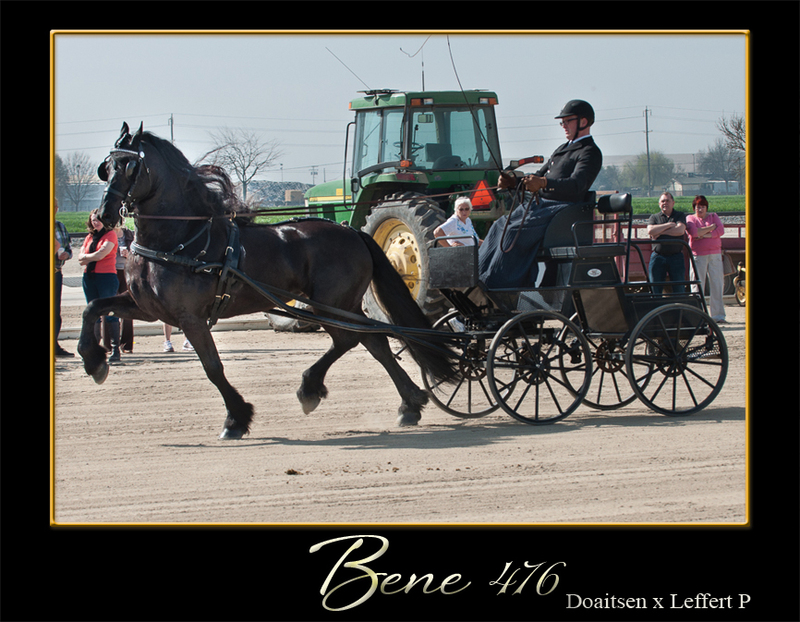 His honest nature makes him a pleasure to work with. 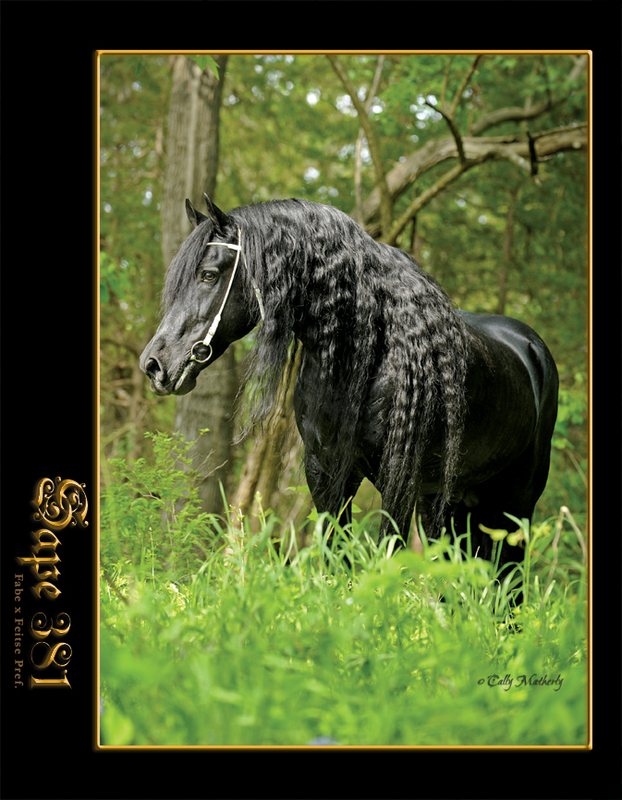 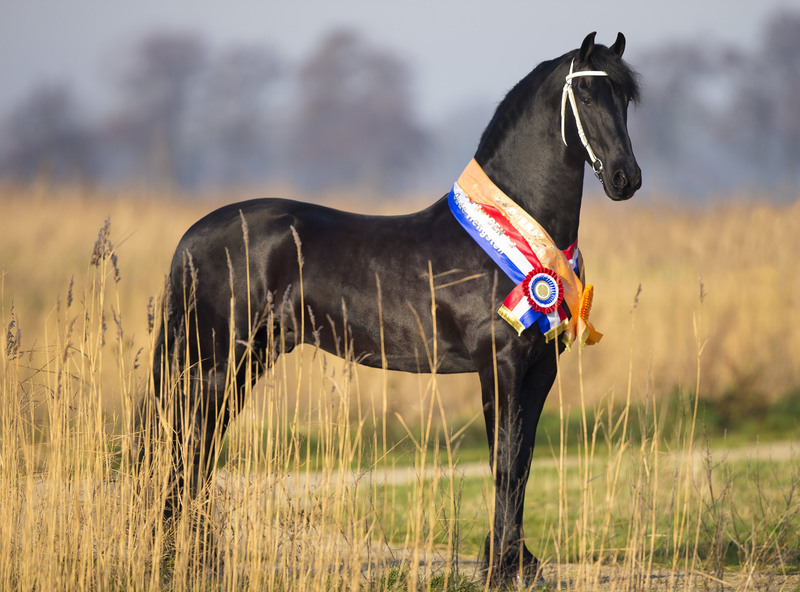 This impressive stallion has been an amazing example of what the Friesian breed exemplifies . 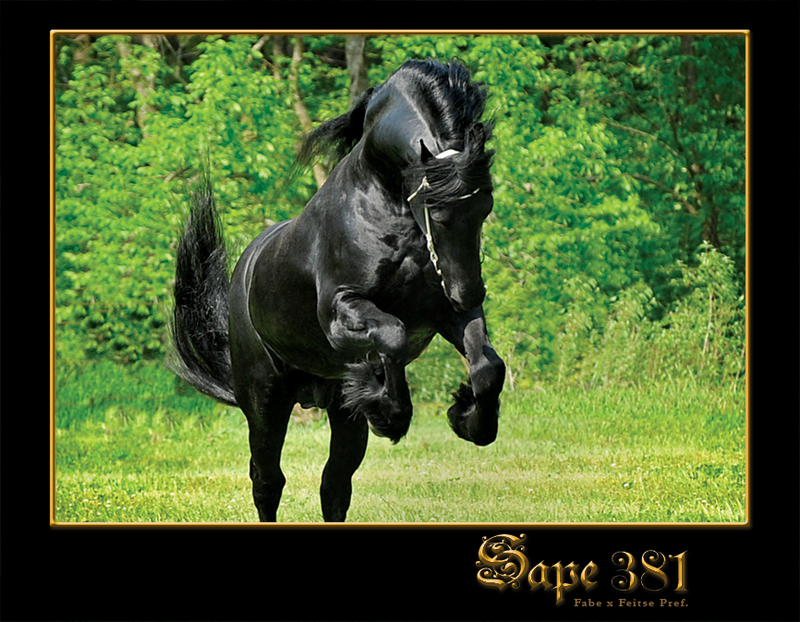 Offspring of Sape are balanced, strong gaits with much stride and gentle natured. 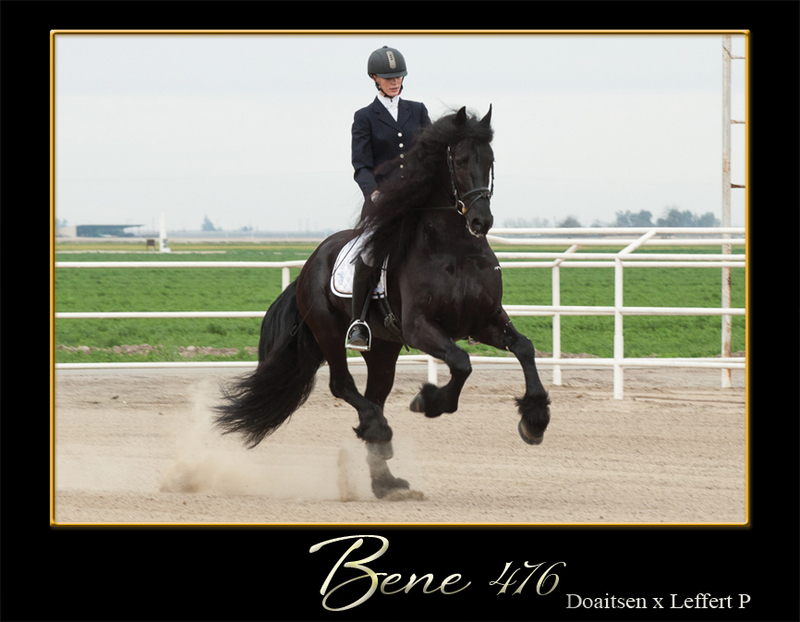 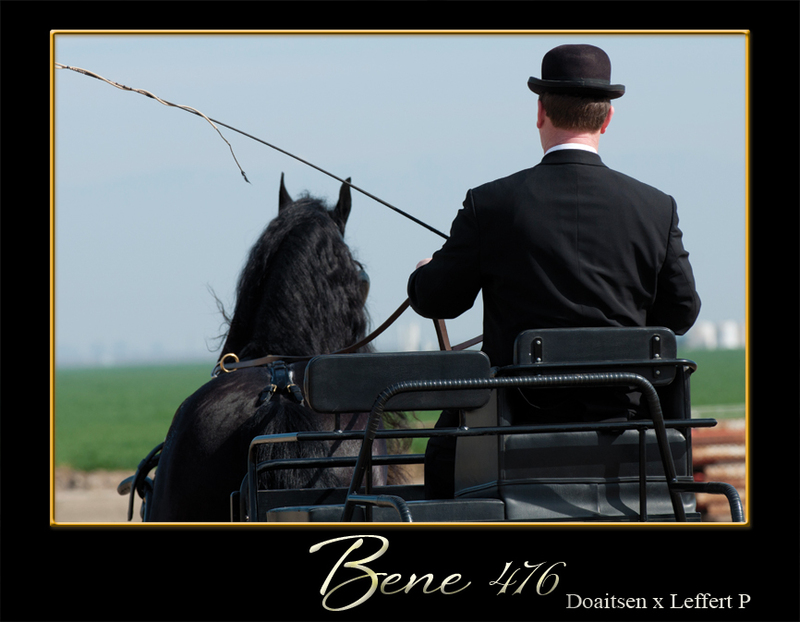 Bene 476 (pronounced Bay-na), formally Bonne fan Signature Friesians, was approved in March 2013 by the KFPS for breeding. 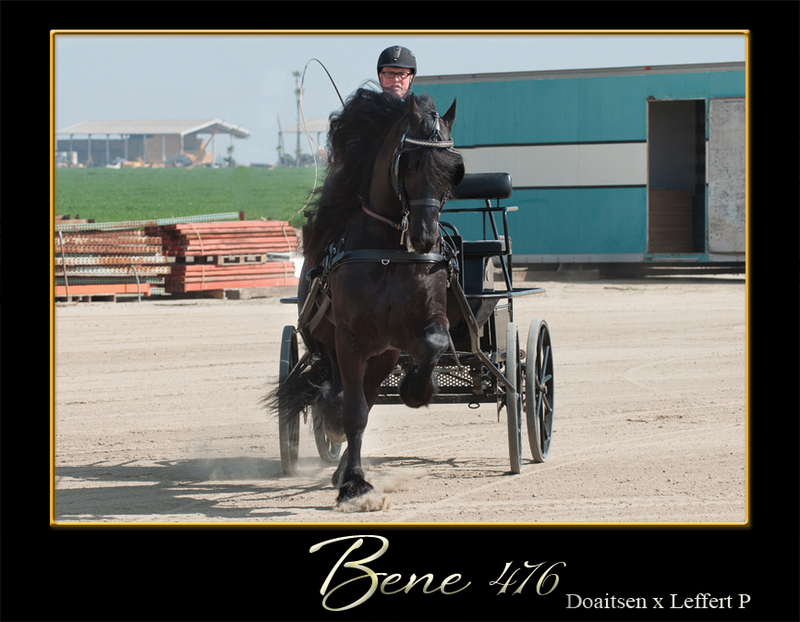 In the 70 day test he scored extremely high in all three disciplines, 87 points for the Riding test, 87 points for the IBOP Driving test and 85.5 points for the Show Driving test. 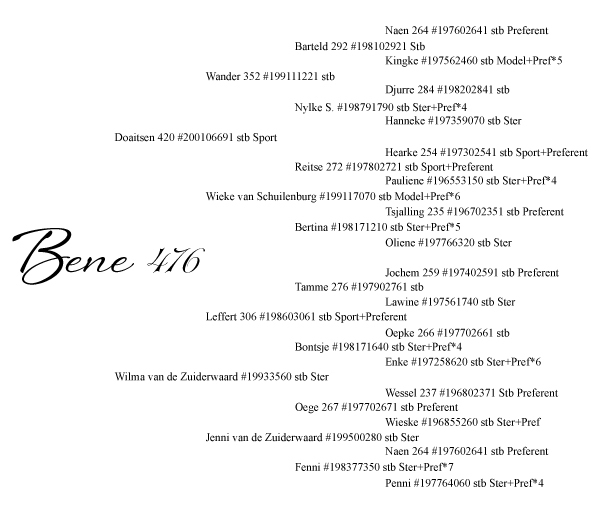 Bene 476 stems from a proven motherline- the famous stamline 50. 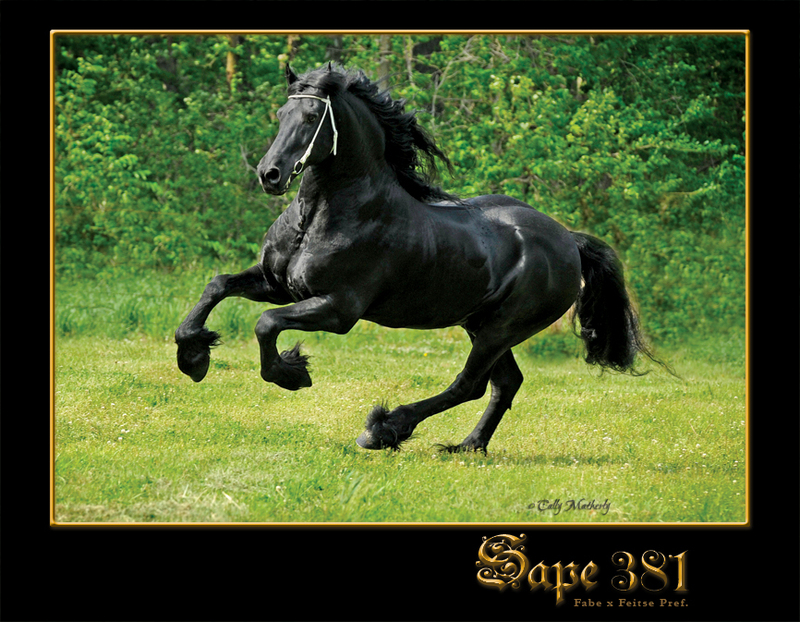 His mother, a Ster-Preferent mare, -- continuing on with S+SP+SP+MP+MP+SP+MP+MP. 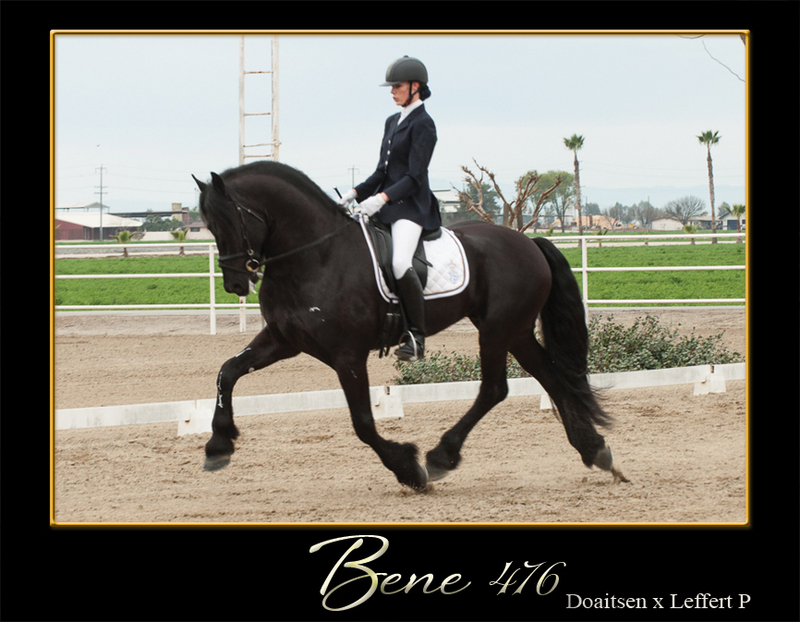 Bene 476 is a very impressive stallion strong in Friesian type/luxury. 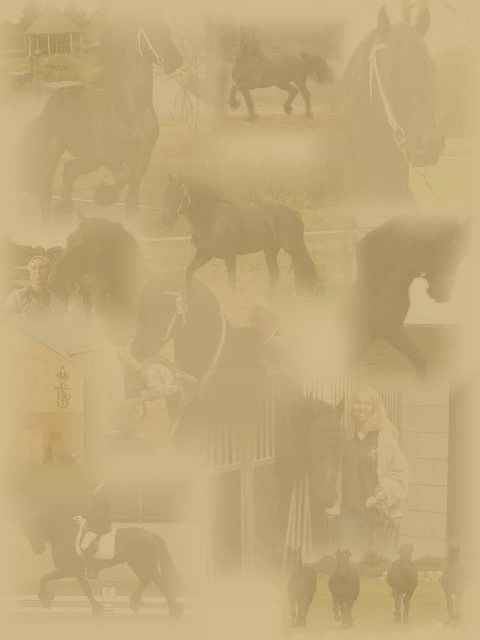 3 amazing, powerful gaits! 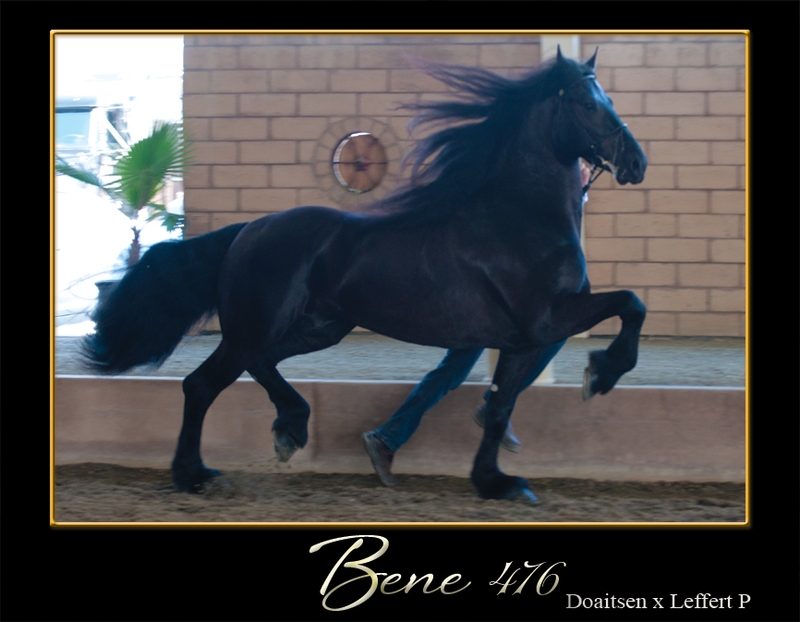 Bene 476 has an honest, incredible, willing, character which makes him a special horse to handle/ train. 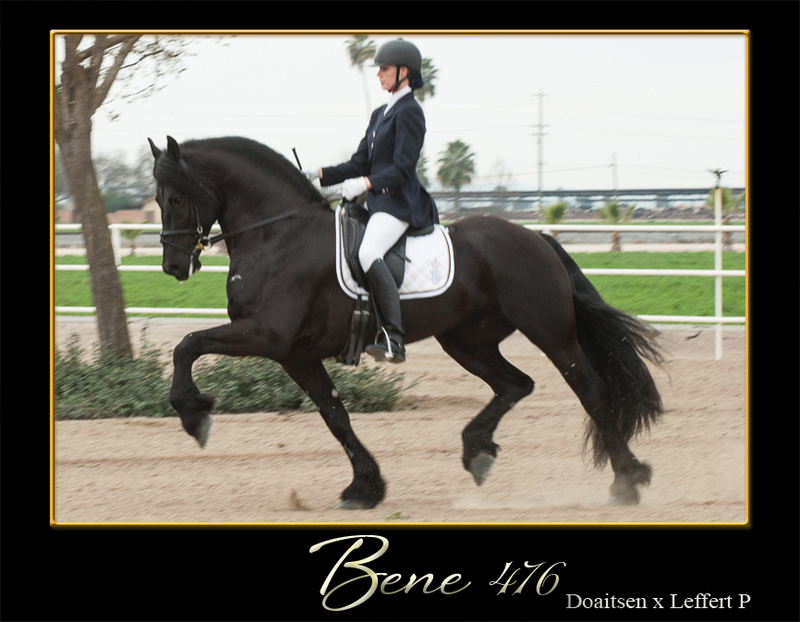 With an outstanding, strong walk, a powerful, ground covering, supple trot and a phenomenal, balanced canter gives Bene 476 has extreme FEI potential. 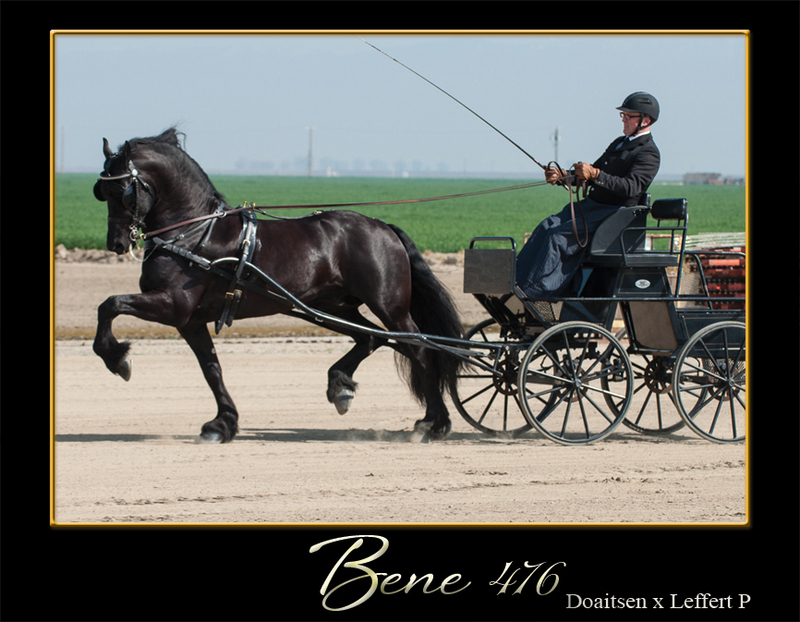 His conformation is balanced, he shows much expression and his work ethic is unsurpassed. 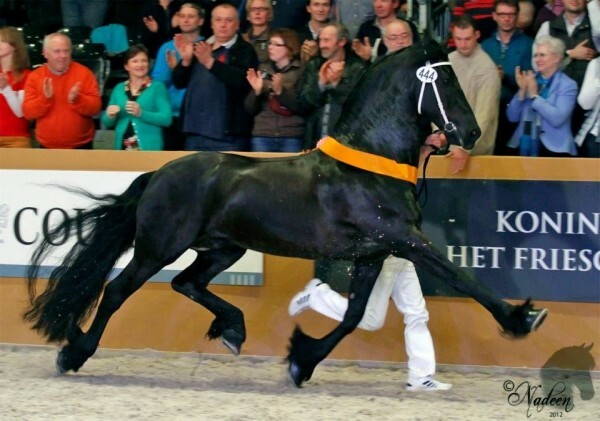 This makes him a very unique and special Friesian Stallion! 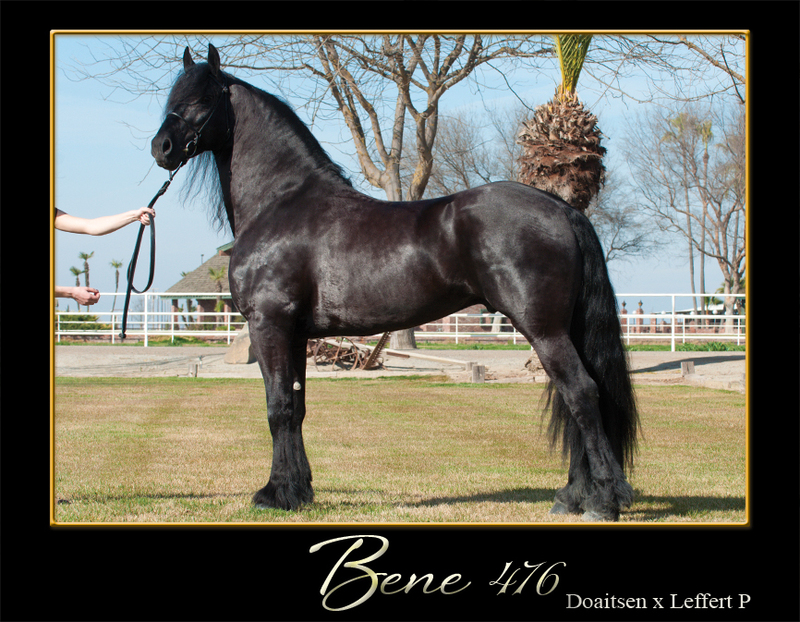 He is 166 cm tall or 16.1+ Hands and growing. 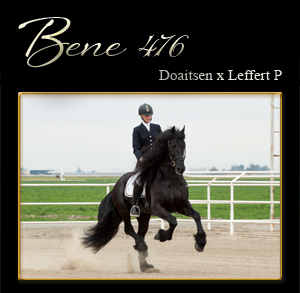 Bene 476 sire is Doaitsen 420 then behind that you have an impressive 3 Preferent stallions, Leffert Pref x Oege Pref x Naen Pref!